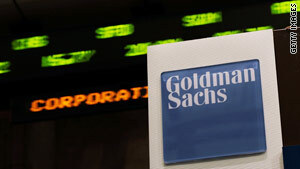 Goldman Sachs has been charged with fraud by the Securities and Exchange Commission. Washington (CNN) -- For Goldman Sachs, a large financial investment in President Obama does not appear to be paying off. Wall Street's top investment bank was a generous contributor to Obama's presidential campaign. The company has defended itself from civil fraud charges filed by the Securities and Exchange Commission and, along with the rest of the financial services sector, fended off an aggressive Democratic-led campaign to impose new rules on banks. According to Federal Election Commission figures compiled by the Center for Responsive Politics, Goldman Sachs' political action committee and individual contributors who listed the company as their employer donated $994,795 during 2007 and 2008 to Obama's presidential campaign, the second-highest contribution from a company PAC and company employees. Only the PAC and employees of the University of California, which donated more than $1.5 million, topped Goldman Sachs. Federal law prohibits a company from directly giving money to an electoral campaign. 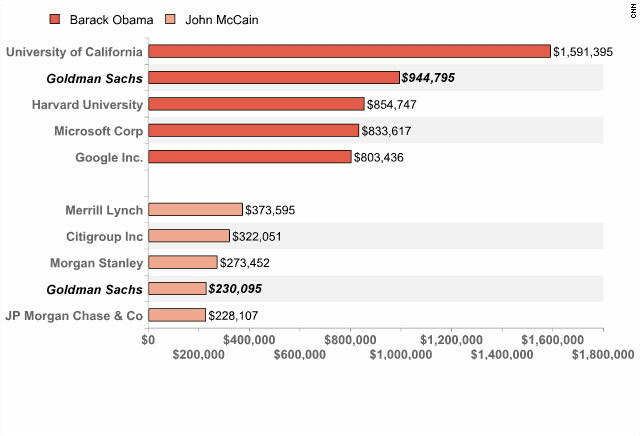 Goldman Sachs contributions to the Obama campaign were more than four times larger than the $230,095 in donations to Sen. John McCain's presidential campaign. "Barack Obama's presidential campaign shattered all records when it came to fundraising, so it's no surprise that he significantly outraised John McCain when it came to contributions from the financial industry in general and Goldman Sachs in particular," CNN Deputy Political Director Paul Steinhauser said. Steinhauser added: "And even though some of the policies he was pushing during his bid for the White House were not so popular with Wall Street executives, it seemed investors wanted to back a winner." According to figures dating to 1990, Goldman Sachs' PAC and employees have consistently contributed more money to Democratic rather than Republican candidates for federal office. In the 2008 election, three out of every four dollars contributed by Goldman Sachs went to Democrats. Since the 2008 election, FEC reports indicate that Goldman Sachs has contributed generously to Senate Banking Committee and House Financial Services Committee members. The two panels are responsible for oversight of the industry.